My family and I had the opportunity to review the movie, Sgt. Stubby, which is based on a true story. What a great entertaining movie this was. It starts with a generous gesture of feeding a dog on the streets a cookie and that is just the beginning. There was even some tissues passes around as there are just a few scenes that were emotional for us. We absolutely enjoyed this movie from beginning to end. From the oldest, 35 to the youngest 4, Sgt. Stubby has made his way into our hearts and I don't think he'll be leaving anytime soon. So much so that my son is excited to look up the real Sgt. Stubby to learn more about him. 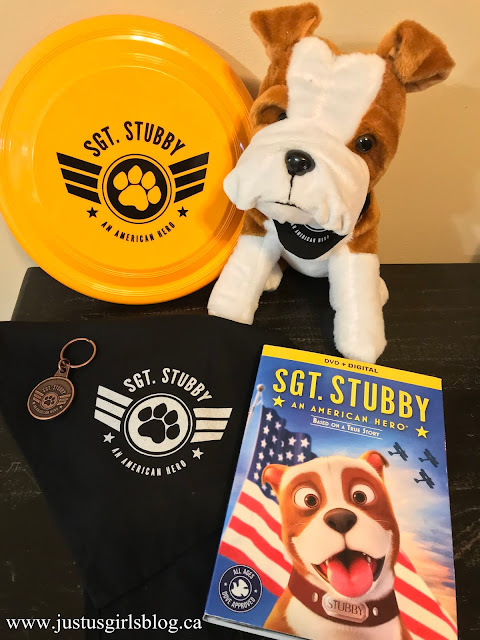 We received a viewing kit that included not only the DVD, but also a plush replica of Sgt. 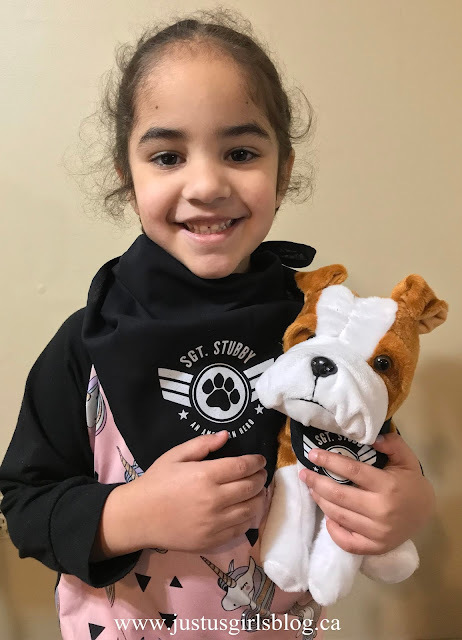 Stubby along with a Frisbee, key-chain and handkerchief, all items my kids have been loving. Out on blu-ray and DVD as of December 11, 2018, Sgt. 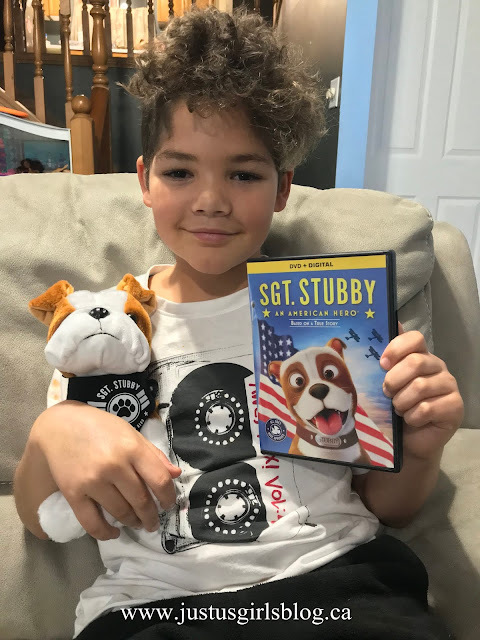 Stubby should be your movie you watch on your next family movie night, I assure you, you won't be disappointed and everyone from the youngest to the oldest will fall in love with this dog. We're excited to be offering one of our US readers a chance to win your very own copy of Sgt. 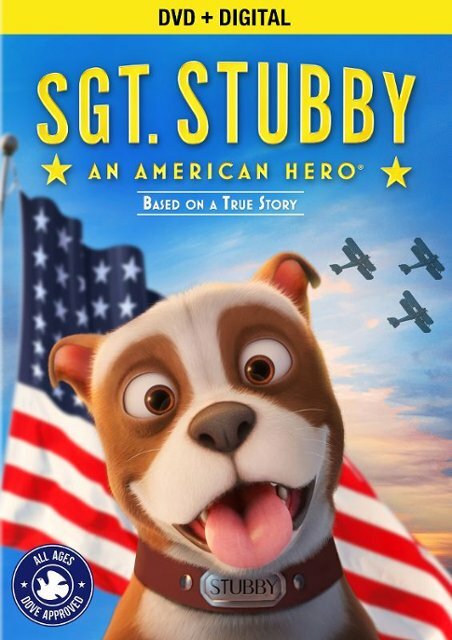 Stubby on DVD. Comment below sharing with us one of your favorite movies that stars an animal. My fave is Hachi a dogs tale! Such a tough decision. I love Milo And Otis. I like Homeward Bound. Super cute movie! I love the movie Ice Age. I love the animals in it and it always makes me laugh. I've always been a fan of Beethoven, who doesn't love a Saint Bernard. I like the Benji movies! Ahhh, there's so many, but Hachi has to be my favorite lately. One of these times I won't cry when I watch it! I love the Batoven movies! My favorite is probably the Grinch! My son and I liked Bolt. Milo and Otis because pugs are the cutest ever. My favorite is A Dog's Purpose even though it made me cry. My family all like Where The Red Fern Grows. My favorite movie with animals is Wizard of Oz. Toto is a cutie. I like Lassie the best. I love Lady and the Tramp. We love the Buddies movies. They are always so adorable and the stories are good. My favorite is Homeward Bound! I loved all the animals, but Chance is my favorite! I would say All Dogs go to Heaven.